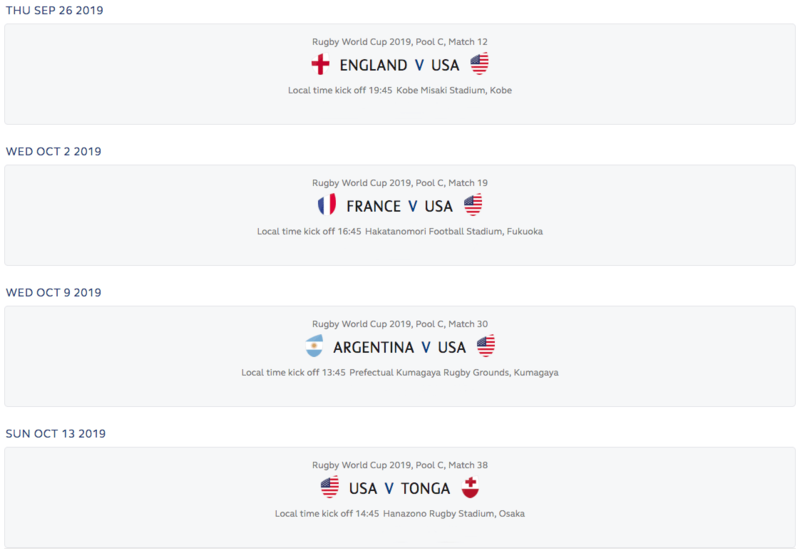 DUBLIN, Ireland - World Rugby officially released the Rugby World Cup schedule for the 2019 tournament hosted in Japan. The United States will first take the pitch on Thursday September 26, against England. "Today the tournament comes to life for the players and fans." said World Rugby Chairman Bill Beaumont, "The announcement of the match schedule and ticketing programme will generate excitement as we all look ahead to a tournament that will break new ground as the first in Asia. "We are grateful to the cities and venues who have been at the heart of this process and will play such a central role in welcoming the world to Japan. We know that this will be a special, once-in-a-lifetime opportunity for Japan to welcome the world to the whole of this great nation and a once-in-a-lifetime opportunity for rugby fans from around the world to experience all Japan has to offer." World Rugby Chief Executive Brett Gosper added: "The development of the match schedule is an important milestone for what will be a very special Rugby World Cup. Throughout this rigorous process, we have had participating team experience for teams and fans at heart. "We have worked hard to deliver a match schedule that improves on the Rugby World Cup 2015 model, delivering a more balanced spread of matches across the four weeks of pool matches and greater rest periods for the emerging rugby nations ahead of matches against the top-ranked teams. These are the foundations that will assist the world's top players to perform to their best in Japan." With Japan's biggest venues optimized, the iconic International Stadium in Yokohama will also be at the tournament's heart with four pool matches, including New Zealand v South Africa, Ireland v Scotland, England v France and Japan v Scotland, while also hosting both semi-finals and the Rugby World Cup 2019 final on 2 November. "I think that we have a great match schedule in place and with the fixtures and locations announced we can all start to picture the stadiums and cities across Japan come alive with excitement and passion." included Japan Rugby 2019 Chief Executive Akira Shimazu, "Fans in Japan and across the globe can now officially start planning their trips to Japan, deciding which city to visit to join the throngs of spectators at the venues. I am also looking forward to seeing more exchange taking place between the host cities and the countries of the participating teams."